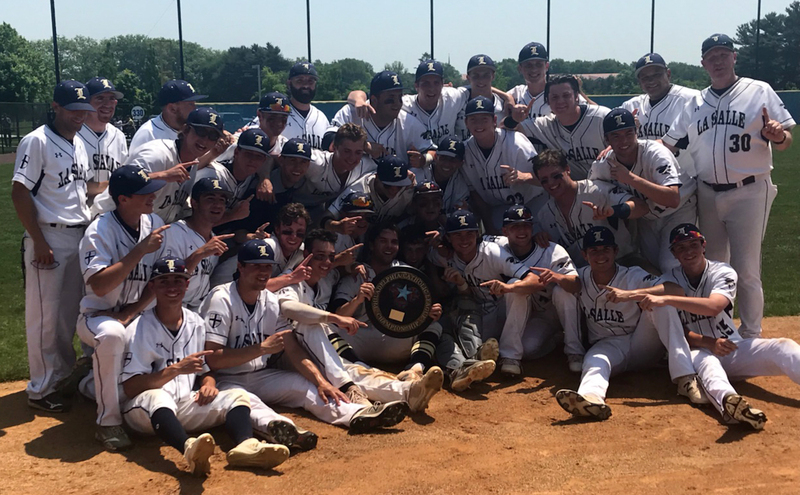 The two best teams in Catholic League baseball met each other in the Catholic League championship May 26 at Immaculata University. La Salle was the regular-season champion with an 11-1 record whose only loss was against second-place Archbishop Carroll. Both teams were loaded in every area. Surely this would be a game – probably a pitcher’s duel – decided in the late innings. La Salle 10, Archbishop Carroll 0. So much for predictions making sense on paper. After dodging a shaky top of the first inning, the Explorers exploded for seven runs in the bottom half, and the first out necessitated a great throw from junior Carroll centerfielder Tyler Kehoe that nabbed senior Eric Marasheski at the plate. A surreal 13 hitters came to bat and hoarded five singles, four walks, a hit batter, and a wild pitch that negated a strikeout. Any suspense was basically muted right there and then. The only thing left for La Salle was to pitch well, play solid defense, and come up with three more runs to enforce the 10-run mercy rule. Miller did the first part by giving up only three hits and three walks while striking out eight. He avoided problems in the first, second, and fifth innings when the Patriots (17-6 overall) put two runners on base but could not cash in. Playing with a seven-run lead has its advantages. 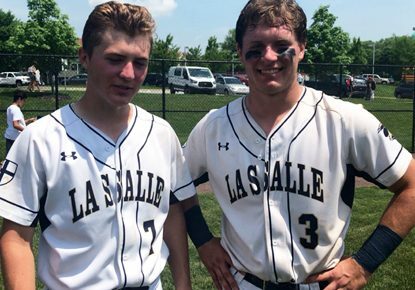 La Salle (20-3), which takes on Public League champ Frankford in the city title/District 12 final Friday afternoon, June 1, finished with 12 hits. Every starter had at least one hit and all but one scored a run. Senior first baseman Brian Schaub ended the game in the fifth inning when his single scored Marasheski (2 for 4, 2 runs batted in, run scored) from third. Teammates and brothers Anthony (left) and Andrew Cossetti savor the moment for which they’d worked all year — capturing the Catholic League baseball championship. The only players to contribute multiple hits were Marasheski and the Cossetti brothers, Anthony and Andrew. The senior fraternal twins made a combined eight plate appearances and produced five singles, three walks, three runs scored, and two runs batted in. Both being able to share the Catholic League championship together was obviously very special. Anthony, a Naval Academy-bound outfielder who is 16 minutes older than Andrew and joked that he reminds his younger brother of his status “every single day,” felt similarly. Standing close by were Cossetti’s parents, Tony and Taunya. Tony Cossetti graduated from La Salle in 1989 but not before winning the Catholic League championship in 1988 as a leadoff hitter under Joe Parisi, who amassed four CL titles and retired from coaching after the Explorers captured the 2014 PIAA state crown. “It’s really surreal,” said Tony. “I’m just so proud of them for all the hard work they put in. They’re such good kids. I always tell them to play with class and to play the game the right way. To come out and play the way they did, I’m just really proud of them. Parisi, the longtime athletic director at La Salle, stood for the twins’ baptisms and confirmations. “When Tony and Taunya asked me to be the godfather of the boys, I was proud to say yes,” said Parisi. “Knowing the type of people they are, I consider it to be an honor to be around Andrew and Anthony as well as their parents. It has been very special to see them grow so much spiritually, academically, and socially on a daily basis during their four years at La Salle. Beating Carroll also allowed the Explorers to avenge a 5-4 setback against the Patriots on April 30. Three would suffice: Catholic. League. Champion.